1. General News Room: Corner of Granby St/Belvoir St. 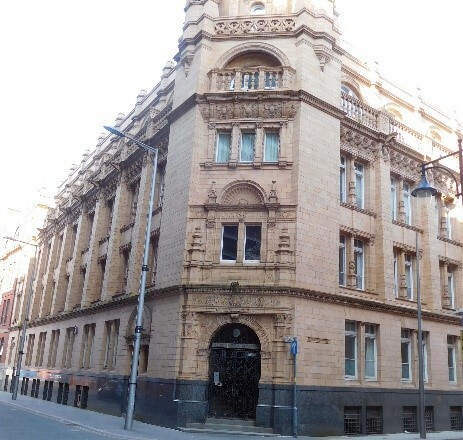 The buff terracotta of the former General News Rooms is featured in a Burmantofts of Leeds catalogue of 1902. The building was designed by the Leicester architect Henry Langton Goddard (Goddard & Co) in 1898. The terracotta sculptures are allegorical male and female figures, the Fates and Muses, designed and modelled by E. C. Spruce. 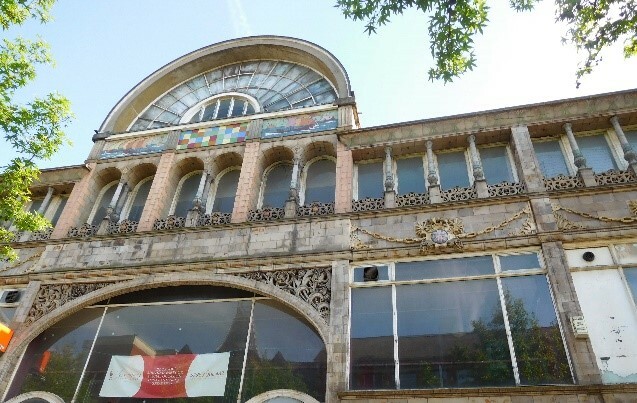 One of Leicester’s most flamboyant buildings with delightful motifs from the asthetic period. 2. 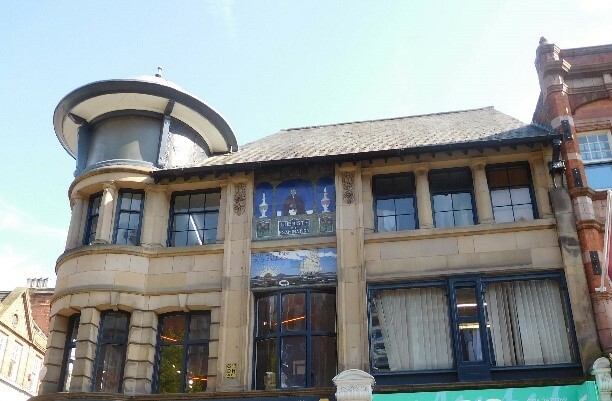 Turkey Café, Granby St: The highlight of Granby Street is the Turkey Café, designed by the local architect and developer Arthur Wakerley (1862-1931) and built in 1900-1. Its narrow Moorish-style facade in coloured Doulton Carraraware is topped by a huge fan-tailed turkey at whose feet are the words ‘Doulton’ and ‘Dimsie 1901’; it seems that Dimsie may have been the artist as there are other Doulton references to him . The Turkey Café was one of a series of popular cafés built for John Winn around the turn of the century, each of which followed the stylistic impulse of its name: Oriental, Sunset, Café Royal. The ground floor frontage of the Turkey Café has been altered at least twice. Brucciani’s bakery installed a turkey-patterned tile mural in 1968, but this was later covered over and the café was restored in 1984, although not exactly to the original design; some replacement ceramic blocks were obtained from Hathernware. 3. Through the market to Market Place South at the end of the Old Fish Market building you will see a sample of a Romano British mosaic uncovered during local demolitions displayed as a wall panel. The grey coloured tesserae are stone; but the red is fired clay. 5. There is now some distance to walk crossing the Southgate carriage way to St Mary de Castro Church, Castle Yard Around the font, beneath the tower are 14th c heraldic tiles in twenty seven different designs. These are very fine examples of medieval tiles, the designs relate to the ones found at Trinity Hospital Chapel. Viewing the actual tiles is by appointment only, but a panel of copies of the tiles can be seen on the adjacent wall. The panel does not say who made the tiles and when. The hospital was founded in 1331, Henry, Earl of Lancaster and Leicester for a warden, four chaplains and five women to care for fifty poor and infirm folk. Henry gave four acres of land next to his castle for the hospital buildings and gardens as well as endowing it financially. Responsibility for the hospital was taken over by Leicester Corporation in 1614, changes have been made to the structure and the chapel is the only ancient part of the buildings still remaining. Nancy Whitcom states, Medieval Floor tiles in Leicester, 1956. The tiles though apparently in their original position include three designs not found elsewhere that seem to be printed not inlaid. A few fragments of what may be a fourteenth century design from Leicester Abbey also show this technique which may have been discovered by the makers of 14th century inlaid tiles but not developed by them. The pavement at the Trinity Hospital fits the available space in the chancel and includes the arms of the founder in sets of four tiles in front of the altar. These printed tiles are unique, so presumably they were made for the hospital. 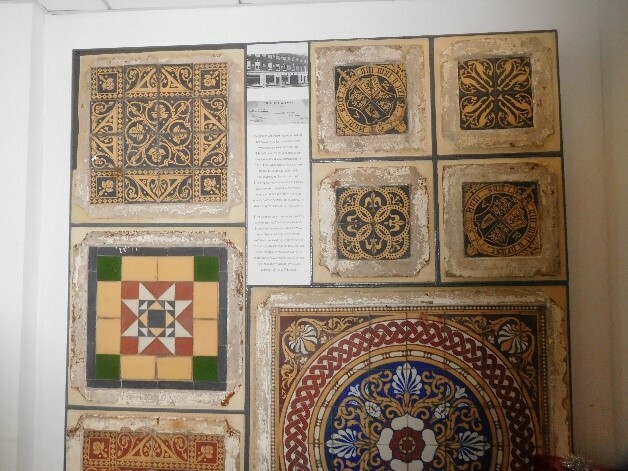 The inlaid tile include the poorest copies and show cracks in the design, so they are likely to have been made when the series was coming to an end. The pavement of the chancel has been repaired with modern tiles but the medieval arrangment and a a large proportion of the tiles have been retained. Prior permission from the Hospital authorities is required in order to view. The site of the Wathes Building (demolished 2003), a nineteenth century cheese factory. Mounted on its facade were sixteen panels of mostly inlaid tiles by various manufacturers including Maw’s and Mintons China Works, there appears to be a Royal Coate of Arms with V and R either side depicted, the panels contain some exquisite examples of Mintons encaustic work; these are now on display inside the BBC Radio Leicester building, and can be viewed by appontment only. Inside the new 2005 building in the public foyer is a large mosaic work by Cleo Mussi entitled ‘Unswept Floor’. On close inspection it is a marvellous example of the mosaicist’s art using only reclaimed ceramic material. 8. Coronation/Singer Building, High St (1902-4, architect Arthur Wakerley), decorated with motifs in Doulton’s blue-­grey Carraraware and their grey and cream terracotta. The building was designed to celebrate the coronation of Edward VII and is packed with pictorial references to the British Empire. A series of faience cartouches at first floor level each enclose a coloured Union Jack and are topped by name panels for the Empire’s constituents along with a representative animal, for instance Australia with its kangaroo. Below the large fanlight, really too high up to make much of a showing, are three ceramic panels, two of which still have their original tiles showing galleons. The building was the main showroom of the Singer Sewing Machine Company from 1904 until the 1960s, and is commonly known as the Singer Building. 9. Also in the High Street is Butler’s chemist’s shop which dates from the 1890s and bears a pictorial tiled advertisement for ‘Sea Breeze’ liver salts. Samuel Butler’s Sea Breeze Factory once stood nearby, and a tile image of an apothocary also part of the shop facade. There is also an interesting modern terracotta shop front further along the High St on the right, possibly from the 1960-70s, nothing is known about this. 10. 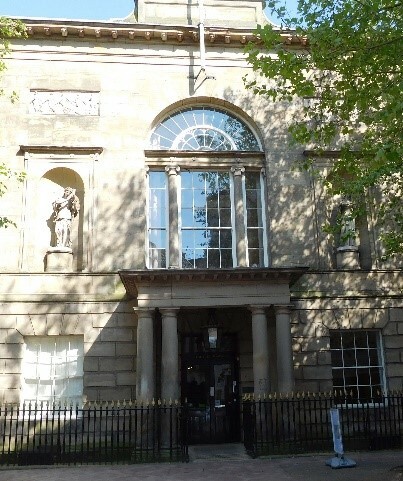 Thomas Cooke Building, Gallow Street Gate. 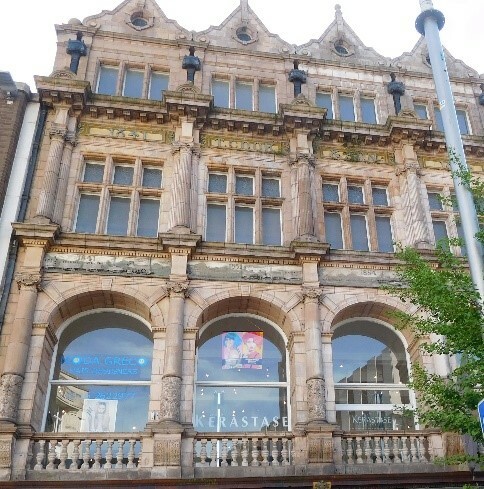 (1894, architects Goddard, Paget & Goddard) with its ornate terracotta façade made by Burmantofts of Leeds, and puzzling set of four relief panels located between first and second floors. The pictorial panels commemorate Cook’s first excursion, by train to Loughborough (1841); an excursion to the Great Exhibition (1851); General Gordon’s voyage along the Nile (1884); and the firm’s golden jubilee (1891). All show suitable forms of transport in splendid detail, but the material from which they are made is unclear. They each appear to have been manufactured in several sections, and could be of terracotta with a metallic or vitreous finish. One of Leicester’s most important buildings. 11. The Secular Hall, Humberston Gate. Designed in 1881 by Sugden of Leek as a meeting place for all free thinkers- the only secular hall to survive outside London. The greatest affront to Christian orthodoxy were the terracotta busts of the great philosophers set in the piers along the front. That of Jesus was intended to be complimentary but was not received as such when in the company of Thomas Paine,Voltaire, Socrates and Robert Owen. William Morris spoke there as did many others of that ilk in the heady days of free thinking, arts and crafts and socialism. Tiles on the outside of the building are William de Morgan Rose design and inside there are also Dutch Arts and Crafts tiles which feature in the Thomas Elsey Catalogue. Probably faience made by the Dutch firm De Porceleyne Fles in Delft during the inter-war period. They did quite a lot of work for things like pubs and hotels in Britain at that time. It is also clad in some very nice mottled faience slab work, though there have been some later spurious black inserts. the opulent decoration of Alexandra House (1895-8, architect Edward Burgess), a massive warehouse built for Faire Brothers and partly clothed in buff Burmantofts terracotta so ornate that it was featured in the 1902 catalogue of the Leeds firm. There are many Faire symbols including ‘F’ motifs and their trademark elephants by the main door; the vestibule has a vaulted ceiling in blue mosaic. On the corner of Queen Street, is the huge Odeon (1937-8, architect Robert Bullivant for Harry Weedon, closed 1997), (now the Athene Club) a striking art deco style cinema with two bold brick slab towers and its curving, winged green and white mottled vitreous local Hathernware faience frontage on a black faience base. Unfortunately much of the Hathernware faience has now been painted over with white paint. And for those who are travelling by train……. the London Road Railway Station was rebuilt for the Midland Railway in 1892; the design was by Charles Trubshaw (1841‑1917), the company architect. A long screen broken by massive archways culminates in a clock tower, the whole being decorated with much orangey-brown Burmantofts terracotta. Inside, the walls of the booking hall have cream embossed tiles combined with various patterns of moulded tiles by Minton Hollins.